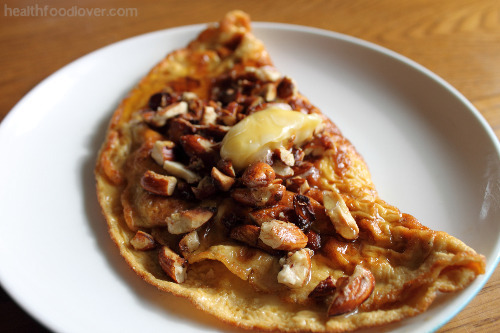 sweet breakfast omelette with toasted nuts, honey and lemon curd. Ahh the sweet delicious breakfast omelette, sister to savoury omelette, and the healthier cousin to pancakes, crepes and toast! Low in carbohydrates and high in protein this is sure to satisfy all egg lovers (and hopefully convert a few!). This is definitely a recipe I had to share with you all! I don’t eat Toast. Well not very often anyway*. Toast just doesn’t do it for me (too dry mostly). (Though you still can serve this on toast). I usually try to have something a little more nutritious. (Have you looked at the label’s on most bread these days? If not have a look, they are mostly full of preservatives and un-healthful chemical ingredients!). My usual breakfast foods are those such as porridge, a green smoothie, fruit, nuts and yoghurt or eggs. Eggs being one of my favourite foods, which is why this recipe came about. But mostly this recipe came about because I wanted something to put lemon curd on and me NOT being a big toast-eater had an epiphany- I thought yes I will make a SWEET omelette with lemon curd- a sort of sweet version of eggs Benedict! And so the Sweet Breakfast Omelette was made! 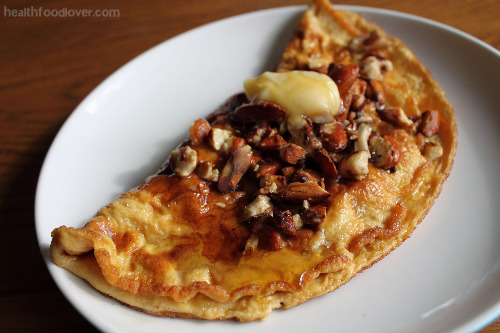 This omelette is milk free and can be dairy free if you use coconut oil instead of butter. It is also grain free (which means no gluten- though if you are making this for someone who is gluten intolerant try to make sure your equipment is away from flour as even a little bit of flour could be harmful to them). I also didn’t add any sugar to the mixture (though I have options to add honey and fruit to serve with it). optional to serve: (see below for ideas). In a bowl beat the vanilla with the eggs until thick. Set aside. Heat the butter in the frying pan on medium heat till the butter has melted and started bubbling. Add the egg mixture into the pan making sure the mixture is evenly spread around the pan. Cook until it is firm and all the liquid has cooked. Fold the omelette over itself and then serve how you like. Watch the butter if it starts to brown then the heat is too high, so just turn it down a bit lower. as a dessert: with a scoop of real vanilla ice cream and maple syrup. *I do love Essene, sprouted grain and sourdough breads when I can my hands on them! So go on, try this if you dare (I promise you, you’ll love it!). 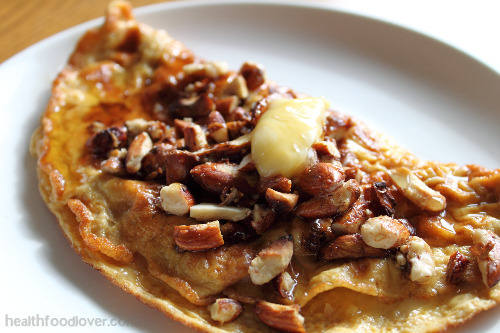 Have you ever had a sweet breakfast omelette? Beautiful photos! 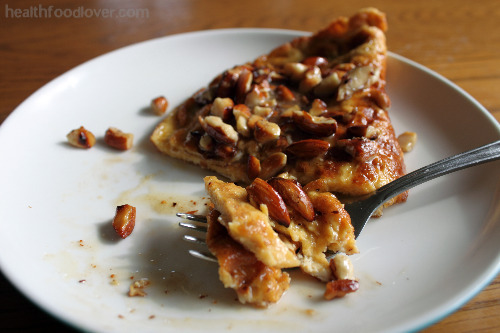 We love sweet breakfast omelettes. They are delicious!